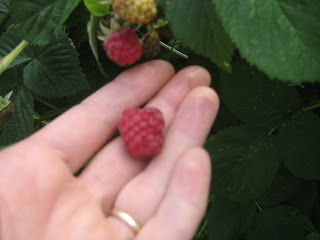 I think it is so funny how the first raspberries ( the first of anything really) are so precious. E just found some ripe raspberries yesterday and we enjoyed them so much. In another month they will likely be dropping on the ground and we will be trying to remember to get out there and pick them so we can make raspberry vinegar and jam. We have also been enjoying a whole mess of peas, the only way we eat them is standing right in the garden munching away. I don't think I've ever cooked them....they never seem to make it out of the garden. Lucky you! 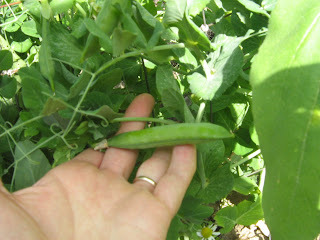 My peas haven't got pods yet, just lots of plant. I am hoping there will be something to eat from them at some point... Fresh peas are the best - my boys don't like them cooked anyways. We've been enjoying raspberries too, they are my favourite fruit. Unfortunately, our peas are pathetic, hardly any sprouted and the ones that did are minuscule!